MotorEasy loves cars – we also love stories. Therefore, when we heard about Omologato and their watches; each uniquely inspired by iconic racetracks, cars or drivers, we were hooked. Omologato’s unique take on personal timepieces comes as a result of more than 25 years’ luxury watch making experience, combined with a lifelong passion for motoring. 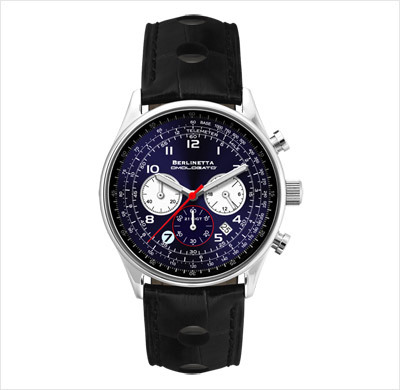 Japanese chronograph movements ensure reliability and accurate timekeeping, with a 2 year guarantee on each piece. The world’s oldest active endurance racing event, the 24 Hours of Le Mans is frequently referred to as the “Grand Prix of Endurance and Efficiency”. As with any motorsport endurance race the key to Le Mans, as it’s known, is balancing speed while keeping the car on track. During the race drivers are tested to their limits at day - and more unusually at night - when tired eyes and reduced vision make things even more difficult. 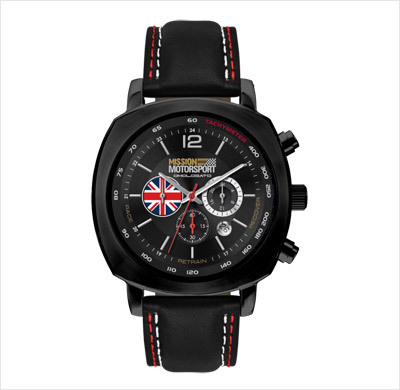 This is reflected in the Le Mans Racing Black edition’s striking colours, complete with classic Le Mans colours. 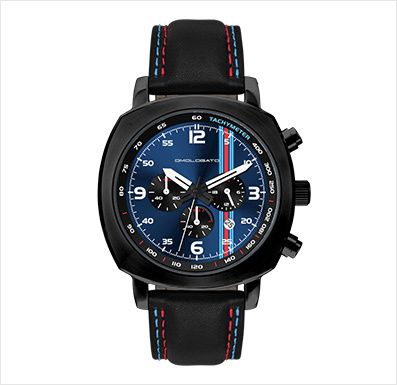 This dark edition would be fitting on the wrists of any of the previous winners include Johnny Herbert, Allan McNish & Graham Hill. Famous for it’s “Corkscrew” section - immortalised by Top Gear’s “Can you learn a track on a playstation?” and later forcing Chris Evans to take a break - the Laguna Seca has always been a test of driver’s skills. The ultimate driver’s racetrack, recognised in the ultimate driver’s watch. With a 45-degree face, you won’t have to take your hand off the steering wheel to check the time, allowing you to focus on the road or track. The original endurance motorsport race, the Mille Miglia, originated in 1927 and was a death defying race, covered 1,000 miles of the most dangerous Italian roads. Dominated by Italians before WWII - with just 2 winners from other nations until 1955. Some drivers raced alone while others opted for a co-pilot – among them, a young Sir Stirling Moss in 1955. Together with his navigator Denis Jenkinson, Stirling made careful track notes which “Jenks” read out to him during the course of the race. The pair won the death-defying endurance race in a famous Mercedes Benz 300SLR – bearing the number 722. The exact time Stirling began his race is highlighted in red on the face of the timepiece. 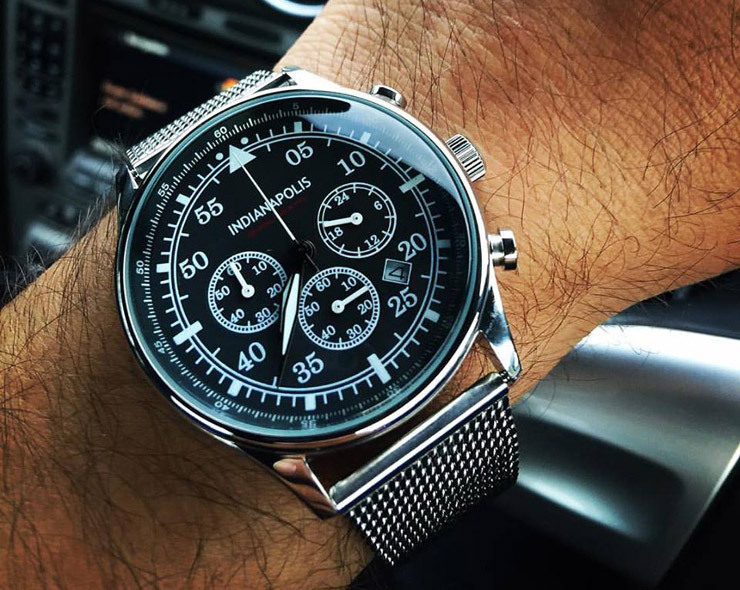 It is also attached to the wearer’s wrist by a period Café Racer style strap, from luxurious Italian leather. The home of the famous Indianapolis 500 (a highlight of the Nascar calendar and a feature in the Triple Crown), the Indianapolis Motor Speedway was constructed in 1909 as the original speedway – with a capacity of 235,000! It’s rectangular oval, typical of Nascar tracks, is decorated by the famous Yard of Bricks at the start/finish line (kept intact from the original surface since 1909!). This iconic track is recognised in The Indianapolis timepiece, with details in Indianapolis Red, the famous Oval and Yards of Brick engraved on the back of the watch. The Ferrari 250 GT, Berlinetta, was originally designed for Sir Stirling Moss to drive at Goodwood’s Tourist Trophy in 1960. However, the plan hit a bump when Stirling suffered an accident on a practice lap, breaking both legs and crushing 3 vertebrae. Following a miraculous recovery, Stirling recovered to not only enter but win the race! Following this he later recorded two more Goodwood wins in the Ferrari in the same year. The car itself is still around (now owned by Ross Brawn) and was recently sold for £7million, making it the most expensive car ever sold in Britain. 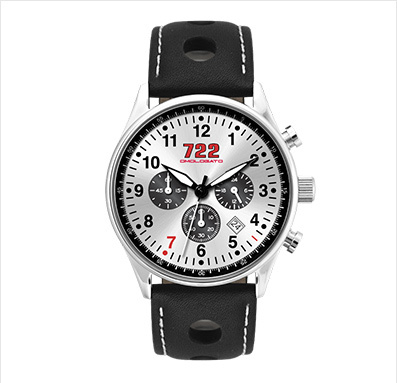 This watch, based on a very British Ferrari with rich racing history can be won this January. The Can-Am (Canadian-American Challenge Cup) was a six race series, two in Canada (hence, Can) with the other 4 based in the USA (Am), running from 1966-1987. It is fondly remembered due to the lack of restrictions on aerodynamics, engine sizes and other parts, it was the closest thing to “anything goes racing” ever seen. Major manufacturers took part in the group 7 racing and included McLaren, Porsche (who dominated for the years the series was active), Ferrari and Lola, to name a few. Through this watch, Omologato has encapsulated an iconic racing era, where motorsport engineering was pushed to its limits and where cars were allowed to race. The work Mission Motorsport does for injured car service men & women is amazing. Omologato has teamed up with this fantastic charity to produce a timepiece fitting for their efforts. We have written a blog on the work they do and how you can help their cause. 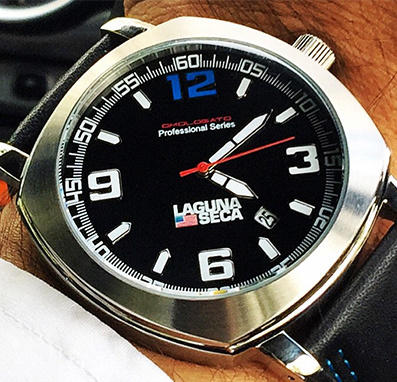 Arrange your free account for a chance to win this beautiful watch. One of the most recognisable racing liveries around, the famous Martini Racing name has a stories & illustrious history in racing. 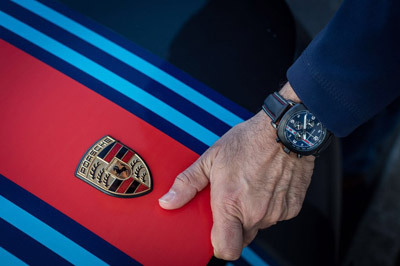 Associated with Lancia, Porsche and Alfa Romeo, their fabulous blue and red stripes can be seen gracing the current Williams F1 racing team, and for the Racing Chrono 24 watch, Omologato has kept true to the world famous drink from Turin. A throwback to the days when playboys ruled the world of racing. If you’ve seen the film Rush, then you’ll be familiar with the antics of Hesketh racing, their love of champagne and their amazing win in Zandvoort in 1975. 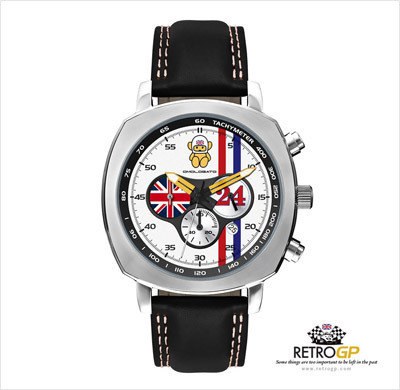 This watch is based on James Hunt’s 1975 car and features the iconic Hesketh teddy bear. Here’s a quick depiction of what it was like to be around the Hesketh team in the 70s. Steeped in racing history, the colour British racing green dates back to the early 1900s, when all motoring nations around the world competed with home-nation built vehicles. Red, white and blue had already been taken by America, Germany and France respectively and so Britain had to come up with a new solution. Over the past century or so there have been many variations of this British racing green, which resulted in the dark shade we now know today. Known the world over, famous racing drivers have fallen in love with the colour and some of the biggest car makers have stuck with the colour over the years to showcase their vehicles - most memorably, Bentley and Jaguar. 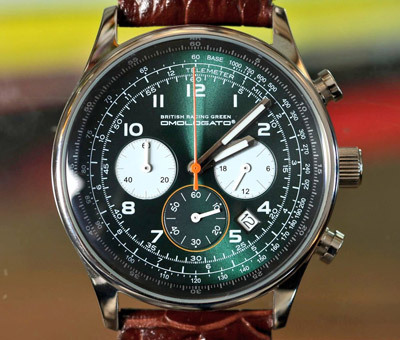 It’s well worth watching the video below for more information on how Britain got it’s racing green. * Simply get a quote for your own free MotorEasy account – displaying your key motoring information in one location with reminders to keep you legal and your motoring costs down. 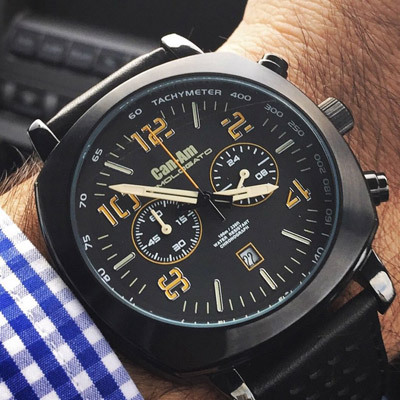 Find out more about Omologato’s range of timepieces.